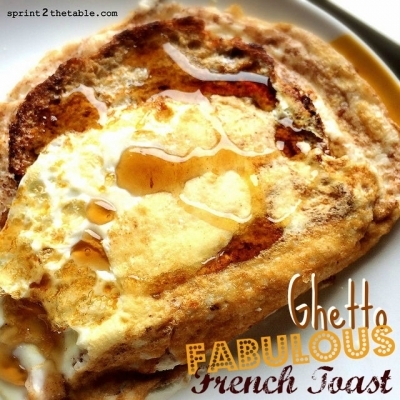 This is the laziest, most bass ackwards way possible to make french toast. Toast the bread while beating egg whites with cinnamon and stevia. Pour egg mixture over the top. Toast bread in small non-stick pan. Meanwhile, beat egg whites with cinnamon and stevia. Pour egg white mixture over toast. Cook 1-2 mins, until mostly solid. Crack whole egg over the top. Flip carefully. I used the plate to help â€“ my spatula is small. Cook 1-2 mins more (will vary depending on how â€œdoneâ€ you like your yolk). Plate, top with syrup, and devour. *Add another egg white or two if you donâ€™t use the whole egg.